Abstract: Depression is a major mental disorder, and is currently recognized as the second-leading cause of disability worldwide. However, the therapeutic effect of antidepressants remains unsatisfactory. 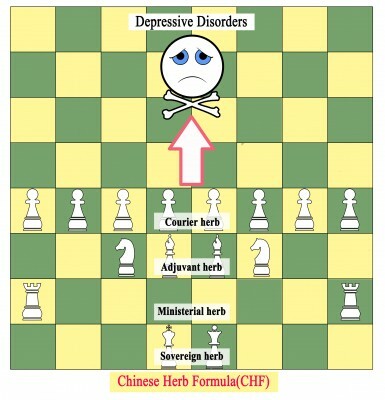 For centuries, Chinese herbal formulas (CHFs) have been widely used in the treatment of depression, achieving better therapeutic effects than placebo and having fewer side effects than conventional antidepressants. Here, we review the ethnopharmacology, phytochemistry, and pharmacology studies of nine common CHFs: “banxia houpo” decoction, “chaihu shugansan”, “ganmaidazao” decoction, “kaixinsan”, “shuganjieyu” capsules, “sinisan”, “wuling” capsules, “xiaoyaosan”, and “yueju”. Eight clinical trials and seven meta-analyses have supported the theory that CHFs are effective treatments for depression, decreasing Hamilton Depression Scale scores and showing few adverse effects. Evidence from 75 preclinical studies has also elucidated the multitarget and multipathway mechanisms underlying the antidepressant effect of the nine CHFs. Decoctions, capsules, and pills all showed antidepressant effects, ranked in descending order of efficacy. According to traditional Chinese medicine theory, these CHFs have flexible compatibility and mainly act by soothing the liver and relieving depression. This review highlights the effective treatment choices and candidate compounds for patients, practitioners, and researchers in the field of traditional Chinese medicine. In summary, the current evidence supports the efficacy of CHFs in the treatment of depression, but additional large-scale randomized controlled clinical trials and sophisticated pharmacology studies should be performed.